It is in understanding this sense of sadou—the importance of the way of tea in the Japanese way of life—that one understands the unique place it holds in traditional Japanese culture. 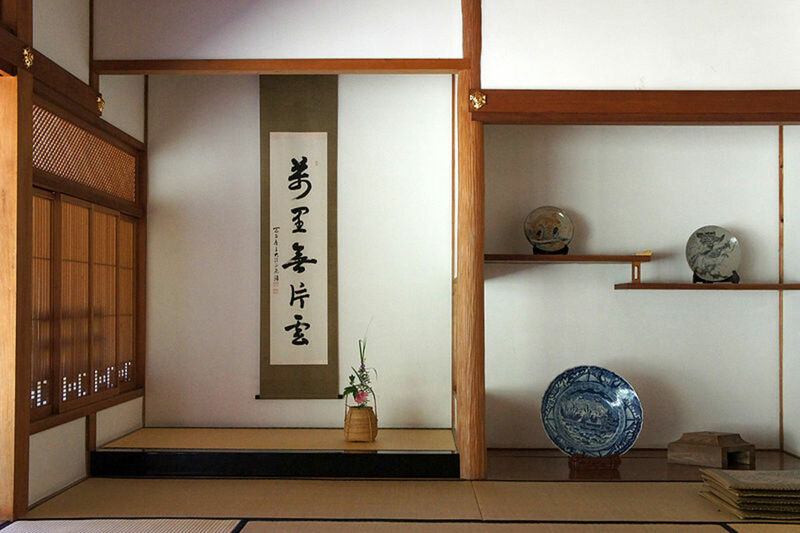 The tea ceremony developed out of the blend of Buddhism and Taoism that is Japanese Zen, and at its heart lies a concern with purity and spiritual calm. Zen Buddhism seeks to find a window into spiritual transcendence, nirvana, in the Daoist effacement of the desiring self and unity with simple, natural experience. Rather than the ascetic practices of abusing the physical body or the mystic reliance on saintly teachers found in early Buddhism, Zen Buddhism focuses on finding inner calm through mindfulness of the self and of physical sensations in seated meditation. This minimalist spirit of self-effacement and appreciation for natural simplicity is manifest in the tea ceremony. In a dedicated place of tranquility, the tea house, participants sit together in mindful peace, in turn sipping a drink of perhaps the most simple, natural drink humans have developed. The fragrant, earthy taste of the mix of leaf and water has been recognized as calming throughout the world. Zen Buddhists found in the peaceful ceremony dedicated to tea’s appreciation a spiritual calm that actualized the ideals of natural harmony and mental purity sought in their practice. Tea appreciation began in Japan as early as the 8th century through tea leaves imported by ambassadors and traders from Tang-dynasty China (618-907). Japan truly made tea its own after monks such as Saicho (in 801) and Eisai (in 1191) brought back seeds of the tea plant and spread its harvest in gardens throughout Japan. The tea ceremony proper finds its origins in a Zen Buddhist practice of taking tea before an image of the Buddha, a ritual cleansing of the mind that prepared monks for sessions of seated meditation. In the Muromachi period (1336-1573), this practice was integrated into the intricate political world of feudal Japan: the ritual of taking tea was implemented between feudal lords negotiating a careful balance of power and alliances. The tea ceremony, in addition to its original Buddhist basis in spiritual cleansing, became seen as a mark of class and refinement, and schools of tea masters formed to lead and instruct participants in proper practice. The tea ceremony can serve many distinct social functions, and the ceremonial procedures differ according to season and occasion. The most informal form is the oyose no chakai (大寄席の茶会 – tea gathering), a large-scale event in which a single host opens their halls or gardens to entertain a large number of guests. These are often seasonal events appreciating natural beauty: full moon viewings, flower viewings¸ snow viewings, autumn leaf viewings. With large numbers and wide halls, the formal, personal exchange of tea takes a secondary role to the natural spectacle, giving the oyose chakai more of the excitement of a public festivity than the intimate serenity of the tea ceremony. The more formal performances of the tea ceremony are called chaji (茶事 – tea event). Though chaji can be held at other times of day to accommodate seasonal weather or the purposes of those gathering, the traditional chaji is a gathering centered at midday. As a formal event occurring between a small, specific group of people, throughout the ceremony the roles of host and guest are strictly divided. The chaji begins with the invitation of guests,. The host sends out the invitation on formal makigami (巻紙 – rolled letter paper), to which the guests respond in kind within 2-3 days to thank the host for the invitation and confirm their attendance. As the tea ceremony was intended to be performed in the tea room, the traditional tea ceremony is limited to serving 3-5 guests. The guest list is usually organized around a central figure – the head of a household, estate, or company – who handles most of the direct, ceremonial interactions between host and guests. When all the guests have arrived, they gather in the roji (露地 – literally “bare ground”), the outdoor garden that serves as an antechamber to the teahouse, to await the host’s summons. At the sounding of a bell or gong, the guests proceed to cleanse their hands and mouth at the tsukubai (蹲 – literally, “bending over,” named for the process of bending down to wash), a stone basin in the tea garden. Thus purified, the participants then enter the tea room through a low crouching door. This short door is designed to direct the guests’ gaze towards the tokonoma alcove as they enter, allowing them to appreciate the hanging scroll and flowers arranged in traditional Japanese style. The guests sit in a semi-circle around the central hearth, careful to leave an open space before the tokonoma alcove so that it remains in view to all participants. Seating locations indicate order of respect: the guest of honor sits closest to the tokonoma, and the prestige of each seat decreases as it moves farther from the alcove and closer to the entrance. Thus seated, the guests are then treated to kaiseki (懐石), a three-course meal served on a legless table. The first course of kaiseki generally consists of sashimi; the second course of steamed vegetables and tofu served in a clear broth; and the third of grilled fish. Bowls of rice and miso soup are served at the beginning of the meal and refilled by the host at each course. A cup of sake is served after the first and third courses, and once more following the meal alongside a pairing of delicacies from land and sea. The dining section of the service is finished off with a selection of traditional Japanese sweets, wagashi. The guests then leave the room for a short recess. The host remains in the room and prepares for the central event of the tea ceremony, the serving of koicha (濃茶), thick matcha green tea. As before, the guests proceed the room at the summons of a gong. Once all are seated, the host demonstrates their cleansing of the chadougu (茶道具 – tea utensils) according to ceremonial procedure. 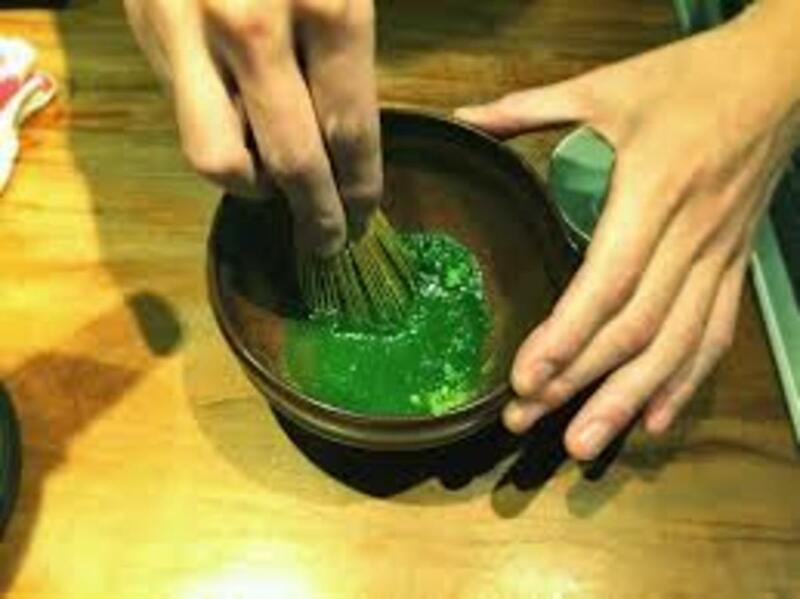 Thick matcha-powder tea stirred by a bamboo whisk is then served in a single ceramic or lacquerware bowl, with the design on the rim facing the guest. After an exchange of bows between guest and host, the guest of honor takes a sip of the tea, rotating the cup to avoid drinking from the design, and passes it down the line to the next guest. The next guest, accepting the tea with another exchange of bows, repeats the procedure, until all guests have taken a drink from the tea cup. The cup is then passed back, and each guest admires it in turn before returning it to the host. Finally, the host once again cleanses the cup and chadougu, ending the most formal section of the ceremony. The host then brings in leisure items, such as smoking sets, higashi (干菓子 – dried sweets), and cushions for the guests to enjoy during the casual usucha (薄茶 – thin tea) portion of the ceremony. A cup of thin tea is provided to each guest, and once everything is set in place participants are now free to engage in more casual conversation. This is the opportunity for the participants to get to the business side of the meeting; depending on the occasion, this can mean cementing political relationships, discussing possible marriages, or simply relaxing and sharing recent family news. To bring the ceremony to a close, the host collects the used utensils and cleans them once more. The guest of honor formally requests to see the cleansed chadougu, and they are passed carefully for inspection in turn among the guests. The cups, whisks, and scoops are often handmade antiques or and their presentation is an opportunity for the host to display some of their most valued possessions.